We have just finished a week (okay, I'll be honest-- it was more like 2 or 3 weeks) of creepy crawly fun. Since I combined bees, butterflies and all other bugs, we had a lot of material to work with! You'll find tons of ideas here-- I hope something inspires you as you plan your own insect theme week (or 2 or 3 weeks)! At the time we completed these activities, Lena was almost 5 and Maggie was a young 3. 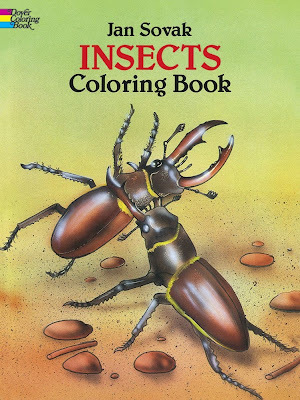 We turned to trusty ole' Dover for some awesome insect coloring this week. 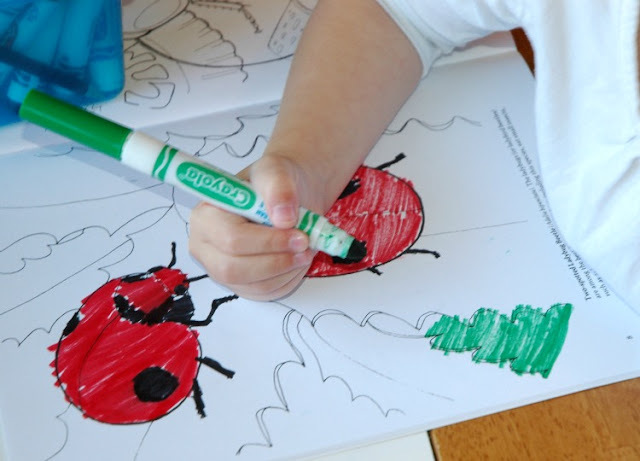 Dover makes great educational coloring books for kids-- we identified critters and talked about their different body parts while the girls colored in this Insects Coloring Book. We pulled out a couple of our favorite puzzles for the week! 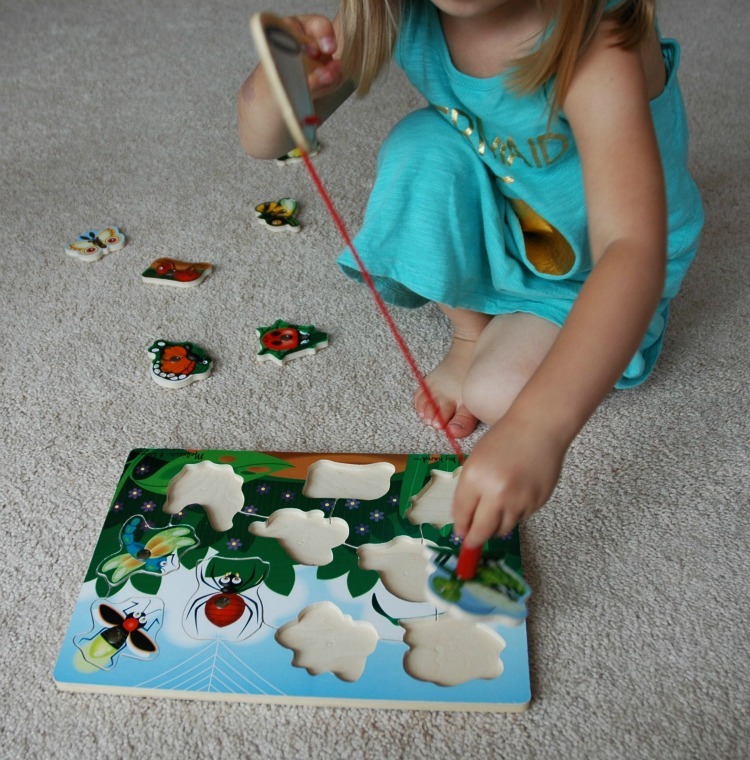 Maggie loves magnetic puzzles like this Bug Catching Game from Melissa and Doug. 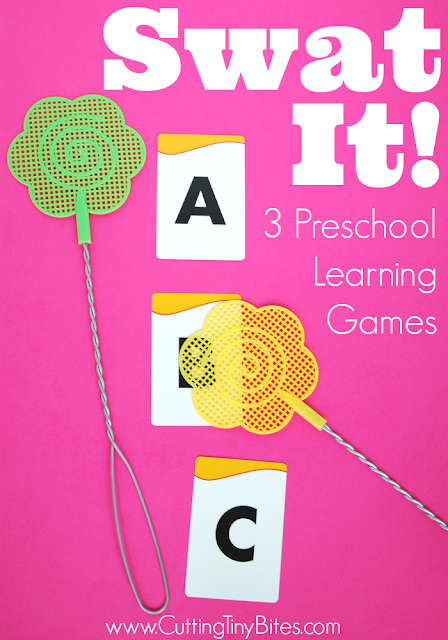 It's part puzzle, part tricky fine motor and hand-eye coordination. I like to call out an insect and have her hunt for it. One of Lena's favorite things to do is to work giant floor puzzles. 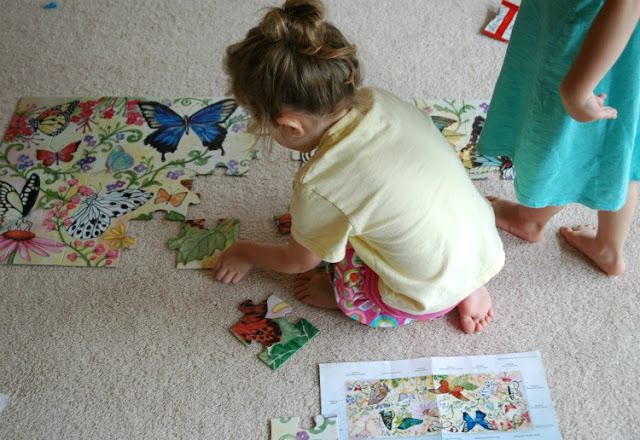 I think that her VERY favorite is this Butterfly Bliss Floor Puzzle (also by Melissa and Doug). Floor puzzles can be a great choice for active children. Lena ends up flopping all over the floor, spinning this way and that, and hopping around the room while she works one of these. It's much easier than sitting still for a regular puzzle! This particular puzzle has a great guide that helps you identify all the different kinds of butterflies. 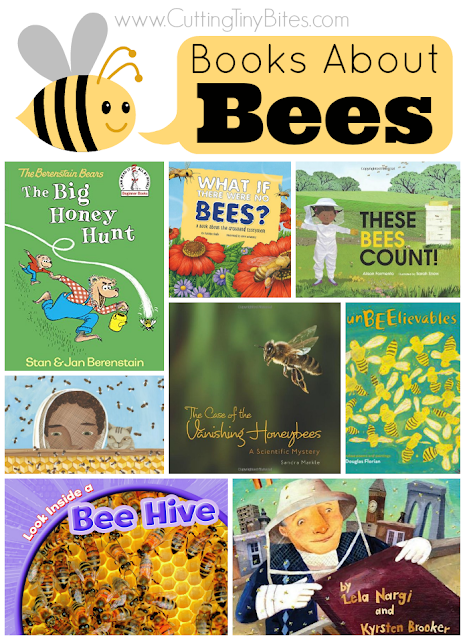 I chose library books this week about bees-- my girls had been absolutely terrified of them. They would want to come in from playing outside if they even saw one! I thought that by reading and learning all about them it might help them realize that they don't need to be afraid. Here's our list of Books About Bees. 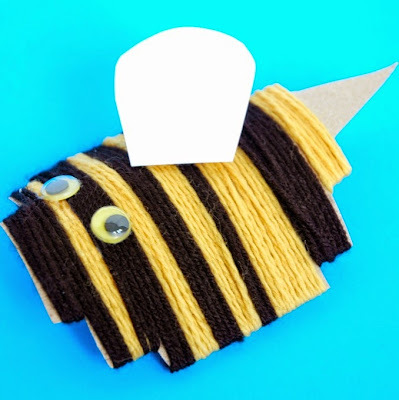 For fine motor work this week, we made these Yarn Wrapped Bumblebees. The girls love working with yarn, and I love how great these kinds of crafts are for little fingers. Swat It! is a great way to squeeze in some preschool learning on whatever topic you may be teaching your children. We used it to wok on letter regognition and sounds, as well as insect identification and a little addition practice. Read all about how to play! 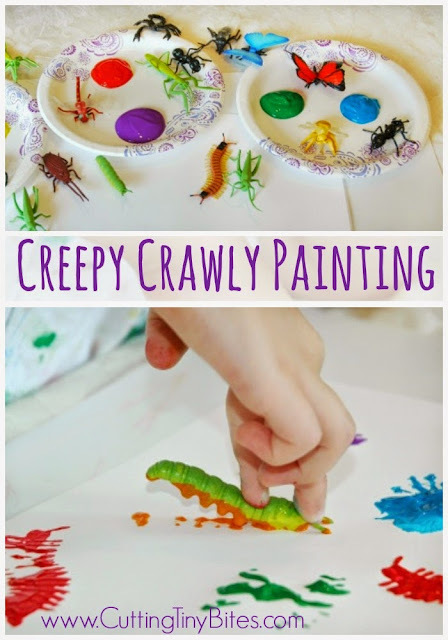 Lena and Maggie loved making Creepy Crawly Bug Paintings. They were so bright and cheerful, and a great process art activity for the week. The Bug Bin got tons of use this week. It was just too inviting to put aside for very long. I'm not sure what it is about beans-- they make even busy mamas want to sit down and play for a while! 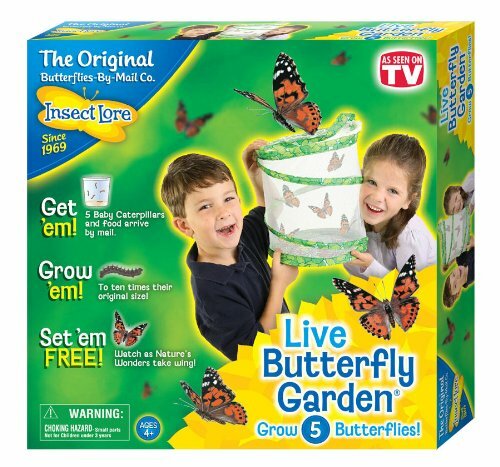 I bought a Butterfly Habitat from Insect Lore for the girls to observe this week. The box contains a the mesh habitat that you see on the box above, and then you send away for some caterpillars. They come in a cup and you watch them grow for a week, build their chrysalises, and then you move them into their habitat. Then they come out as butterflies and you can feed and watch them for a few days before setting them free. Ours are still crawling around as caterpillars, but the girls absolutely LOVE this project. They sit and stare at them a dozen times a day. They have noticed all kinds of things about their behavior, body parts, size, and activity level. It's almost time for them to build their chrysalises and they can't wait! We have talked about the butterfly life cycle as they're growing, and they're getting to observe it first hand. 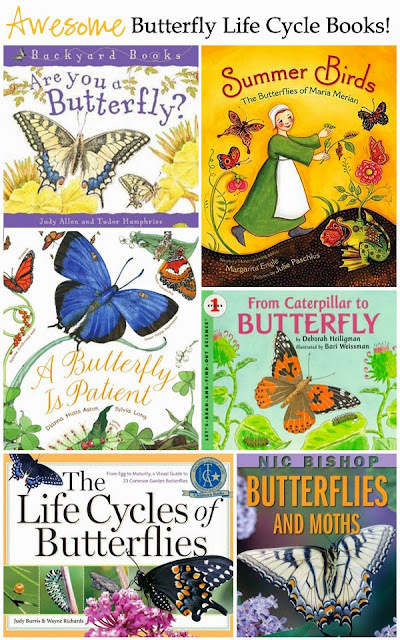 The books on this list from The Creative Salad will teach your kids all about the butterfly life cycle. It's such a fascinating process, and these books showcase it beautifully. 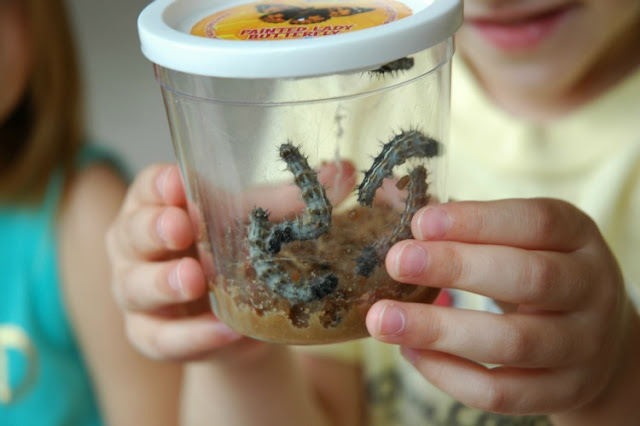 Some of the best preschool songs are about insects! This week we enjoyed singing and doing simple motions to "The Itsy Bitsy Spider" and "Bringing Home A Baby Bumblebee." I also played" Flight of the Bumblebee" and let the girls buzz around the room. 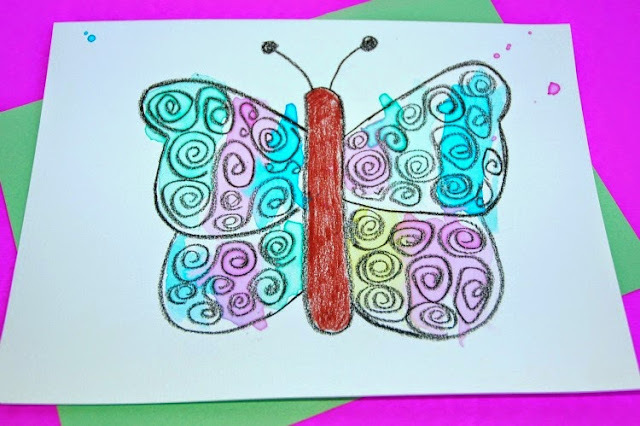 My favorite art project that we completed this week has been these beautiful Crayon Resist Butterflies. 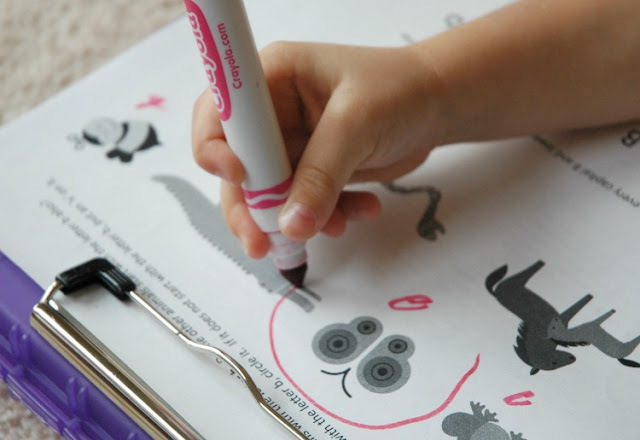 Somehow, we've made it through several years of at-home preschool without ever using this art technique! 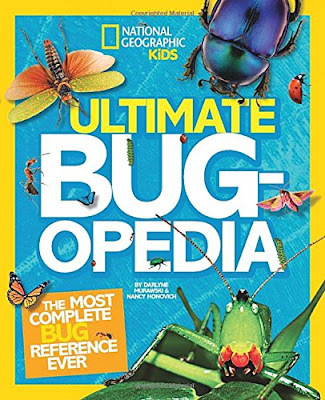 We originally checked out the Ultimate Bugopedia from the library, but the girls and I thought it was so awesome that I bought our own copy. It's great to have quality reference materials on hand, and this sturdy guide from National Geographic doesn't disappoint. It has bright, crisp pictures and tons of information. Some of the content is a bit too complicated for my girls right now, but they still enjoy thumbing through it and will be able to use it for years to come. We spent a lot of time on the couch this week flipping through it and talking about all the pictures. I love the bug printables here from The Happy Housewife. The pack contains patterning, scissor skills, basic addition, and more! Lena and Maggie both love completing patterning pages-- they get to cut, glue, AND complete the pattern. 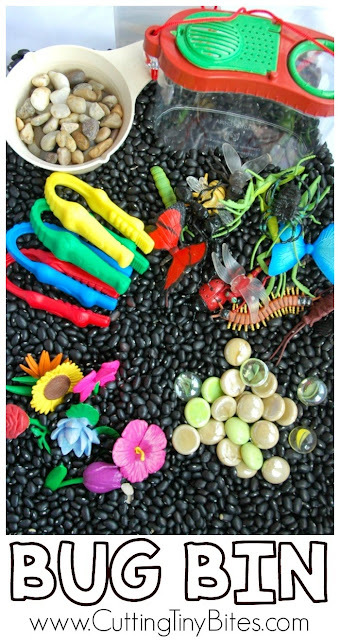 If you're looking for even more ideas to use for an insect theme preschool week, check out the What Can We Do With Paper And Glue Pinterest board below for tons more preschool craft and learning ideas about bees, butterflies, and other bugs. Insect Theme Weekly Homeschool Preschool. 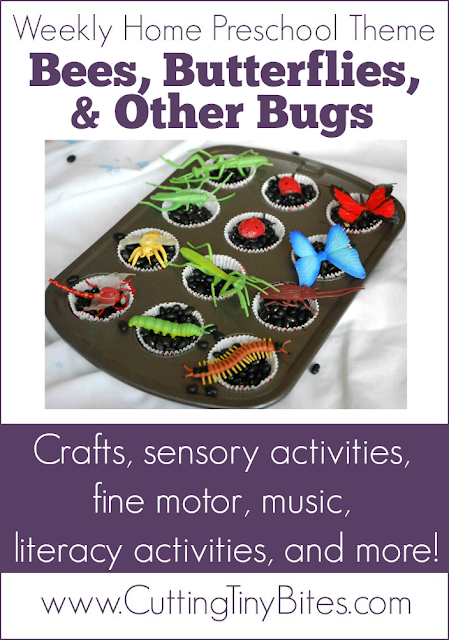 Butterfly, bees, and other bugs-- crafts, art, sensory, science, music, literacy, fine motor, gross motor, and more! 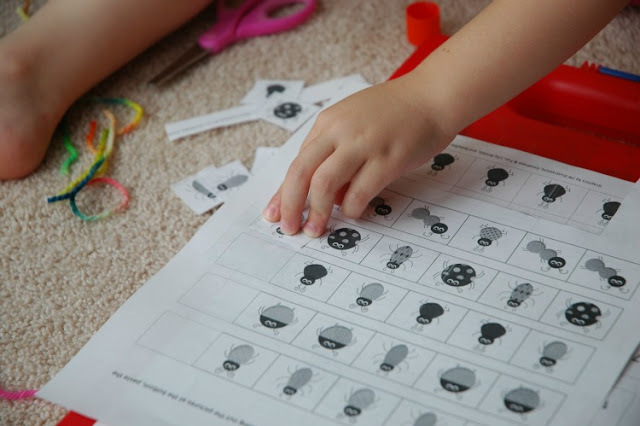 EASY activities for one week of home preschool bug unit.